My friend Robert prepared the following recipe for this month's Chef Spotlight dinner where we highlighted Spanish chefs and cuisine. This dish is the creation of Ferran Adria, the chef that inspired me to highlight Spanish chefs. I love how the toasted spaghetti adds a depth of flavor to this dish! In a large deep skillet, heat the olive oil until shimmering. Add the spaghetti and cook over moderate heat, stirring constantly, until golden, about 3 minutes. Add the garlic and a large pinch of crushed red pepper and cook until fragrant, about 1 minute. Add the clam broth and water and bring to a boil. Cover tightly and cook over moderate heat until the pasta is barely al dente, about 8 minutes. 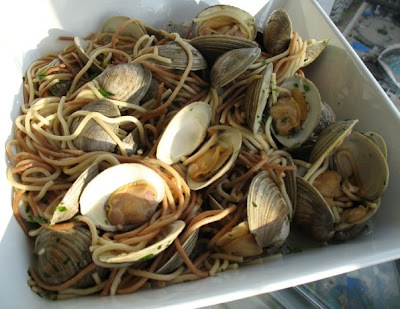 Nestle the clams into the pasta, cover and cook until the pasta is al dente and the clams open, about 7 minutes. Add a few tablespoons of water if the pasta is too dry.